The origin of the fantail goldfish dates back to over a thousand years. 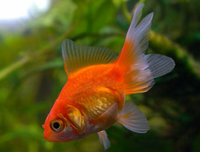 It is one of the oldest goldfish varieties known , and it is still a very popular goldfish. In the early 1500's these fish were exported first to Japan and then to Europe and were developed into the wonderful colors and forms of gold fish we see today. The Fantail Goldfish is one of the more than 125 captive bred fancy gold fish varieties. The Fantail Goldfish are available in three scale types: metallic, a solid reddish orange, nacreous which is speckled, and matt which is a whitish color. They are an egg-shaped variety of goldfish. The body is short and stubby and the head is very wide. The average goldfish lifespan is 10 – 15 years, though living 20 years or more is not uncommon in well maintained goldfish aquariums and ponds. Goldfish are very social animals and thrive in a community. Not only are they a great community fish but they are great scavengers as well. The Fantail Goldfish, along with the Ryukins, are some of the only egg-shaped goldfish that can readily compete for food with the elongated goldfish such as the Common or Shubunkin Goldfish, so can be housed with them. It is really not necessary to add other scavengers or other bottom feeders to the aquarium when you have goldfish. Most fancy goldfish will thrive in both freshwater and tropical aquariums as long as there are no aggressive or territorial fish in the tank. Some good tank mates for fancy goldfish are the Chinese Blue Bitterling and the Northern Redbelly Dace. Since they are omnivorous, the Fantail Goldfish will generally eat all kinds of fresh, frozen, and flake foods. To keep a good balance give them a high quality flake food everyday. To care for your goldfish, feed brine shrimp (either live or frozen), blood worms, Daphnia, or tubifex worms as a treat. It is usually better to feed freeze-dried foods as opposed to live foods to avoid parasites and bacterial infections that could be present in live foods. Fantails are among the easiest of the fancy goldfish varieties to breed and will usually spawn readily given adequate conditions. To boost the overall health of fantail goldfish, supplement their diet with plenty of fresh vegetables, such as zucchini, romaine lettuce and peas.